Les Pyramides Hotel is a traditional Merzouga guest house situated in the southeastern side of Morocco, located in a prime area in the central Sahara Desert. The area of our hotel is a quiet residential part of Merzouga and Erg Chebbi Dunes. >Les Pyramides Hotel is a traditional Merzouga guest house situated in the southeastern side of Morocco, located in a prime area in the central Sahara Desert. The area of our hotel is a quiet residential part of Merzouga and Erg Chebbi Dunes. The hotel offers nine spacious guest Rooms fitted with single, twin and queen-size beds, and a Campsite in front of the big sand dunes. The Room furniture is made in original style by local wood craftsmen, and the showers are very clean. Facilities include free broadband and wireless Internet access, a personal safety box, Satellite TV and safe parking. There is a little village located a mere 10-minute walk away where guests can buy all basic things. 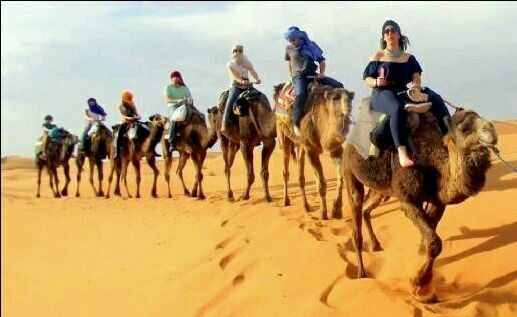 During a holiday in Morocco, guests staying at the hotel can enjoy various activities such as trekking, excursions and wellness treatments.